It has multiple tie-down holes to secure your mobility unit and it is made of a heavy and durable steel with a powder coated black finish. Tools required to install the unit: 17mm wrench, 13mm or 1/2" wrench,19mm or 3/4" wrench and a Phillips screwdriver for installation. With the ability to carry 500 pounds, the lightweight materials also provide you with greater maneuverability when transporting larger, heavy-duty scooters and chairs. 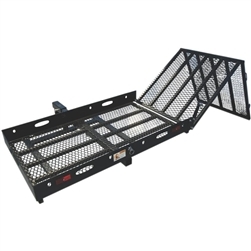 This oversized ramp has a 28"x 48" platform and a 60" folding ramp. 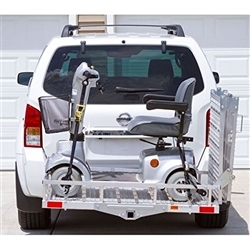 The unit carries up to 500 lbs., accommodating most users and mobility devices. 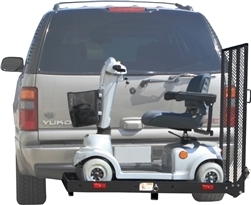 The Outside Manual Vehicle Lift is attached to the car and used for easy mobility of your mobility unit.